Did you know that several organizations make coloring books for persons of all ages who are blind and visually impaired? In this post, we will introduce you to several coloring books with varying themes and objectives. Perhaps you may discover a new hobby that you may have thought was beyond your reach. The American Printing House for the Blind, (APH) has developed a series of three coloring books called Lots of Dots. 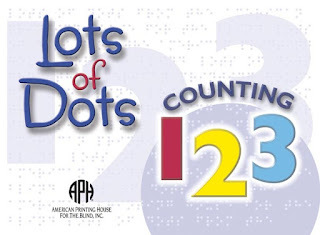 Lots of Dots: Counting 1 2 3 is one book in the Lots of Dots Coloring Book Series. An exciting set of three raised-line coloring books designed for future large print and braille readers. The books are designed for sequential use; children develop character recognition, pre-literacy, and pre-math skills, and eventually picture building and daily living skills. · The second page shows the number and tactile graphic depiction of easy-to-find objects that begin with the same letter as the number, i.e., five fans, seventeen seashells, etc. Attached to the inside front cover is a plastic stencil of three large braille cells. This can be folded over the blank pages, allowing the child to practice the braille cell for the number by tracing or by using the accompanying foam braille chips. This book uses uncontracted braille. The second book in the series is called Lots of Dots: Learning my ABC's. · The second page shows the letter and a tactile graphic depiction of an easy-to-find object that begins with that letter. The third and final book in this sequential series is named Lots of Dots: Coloring the Garden. This book presents a variety of fruits, vegetables, and herbs, and introduces picture building. The book begins with an empty garden. Each page adds a new feature, i.e., clouds, rain, seeds, and plants. Once the garden has grown, a new garden item is introduced on each page for the child to color. The enrichment activities are simple recipes that the child and parents/siblings/teachers can do together. The activities present daily living skills, such as planning, organizing, and food preparation. This book uses uncontracted and contracted braille, where applicable. To better enjoy this book, children should first complete Lots of Dots: Learning My ABC's and Lots of Dots: Counting 123. The Lots of Dots series is intended for people age’s preschool and up. The second book is called Let’s Count and Color; it is a raised line coloring book in print and Braille with ten pages for coloring. The third book is called The Farm, and it is a raised line coloring book with ten pages for coloring. Along with the coloring books, themselves, NBP also sells a box of eight triangular Crayola crayons designed to remain in place and to keep from rolling off surfaces. These books are listed in the section for children; no recommendation is given for the age at which children are ready to use the books, and adults may find them enjoyable also. See and purchase these and the other children’s activity books at http://www.nbp.org/ic/nbp/publications/activities.html. This store contains several departments of products for persons with differing disabilities including blindness, deafness, and mobility impairments. Their coloring books focus on the four seasons with one coloring book devoted to each season. Each book contains nine or ten pages of pictures appropriate for that season which can be colored. They also sell a coloring book featuring farm animals, one featuring favorite toys, and an additional section of other children’s activity books. Read about and purchase these books at www.hearmore.com/categories/175/Braille/Tactile-Books.html. Many of these same books also are available from MaxiAids, another store carrying products for people who are blind and visually impaired. See their coloring books and other products at http://maxiaids.com/. Tactile Vision Graphics sells many of the coloring books listed as available from MaxiAids and Braille Products for the Blind; however, their page gives a detailed explanation of how these books were created, information on the child who created them, and a list of reasons to purchase them. Go to http://tactilevisiongraphics.com/tactile-colouring-books/ to read the information and to http://tactilevisiongraphics.com/product-category/braille-colouring-books/ to purchase them. 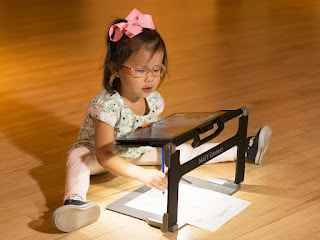 The Braille Superstore offers four Touch and Trace books; the site says, “Blind children will adore these ground-breaking tactile Braille picture books, great for reading readiness and superb for coloring and tactile recognition.” Books include My First Shapes, My First Letters, At the Farm, and Christmas Carol Coloring. View and purchase these books at http://www.braillebookstore.com/Touch-and-Trace-Books/. At one time, National Braille Factory marketed their coloring books as adult coloring books, ones that persons of any age could enjoy. While such wording is not found on their site, the site also does not specify that the books are meant only for children to use. The site lists the name of each coloring book available currently and a list of the pictures in each book. There are two Christmas coloring books, one seasonal book that contains pictures like hearts, Easter eggs, and ghosts, seven basic coloring books with pictures of general items, one shapes coloring book, one animal coloring book, and a dog-themed coloring book. Availability of some books is subject to change so check their site to determine if books are added, removed, or temporarily out of stock. National Braille Factory welcomes ideas for other coloring books; to contribute an idea, email suggestions@braillefactory.com. Browse their selection of coloring books at http://www.braillefactory.com/colouring.htm. Maybe you thought previously that persons who are blind and visually impaired could not participate in coloring pictures or that no coloring books made for blind and visually impaired persons actually existed. Now that we have dispelled this myth, you may wish to color, even if it is outside the lines. As APH says when describing their Lots of Dots series, learning by coloring is fun!